Abu Dhabi Capital Management (ADCM) signed Friday (25 April 2014) an agreement to build a hotel within the Atlas Capital complex in Podgorica, one of the largest and the most luxury multipurpose centers in the region. People at Atlas Capital voiced their expectation that the six-story hotel would be finished by the end of the next year. Aside from the hotel, Atlas Capital already includes luxury suites, offices, embassies and retail stores. ADCM CEO Jassim Alseddiqi said that Abu Dhabi Capital Management has a tradition of investing in good and highly-lucrative projects. - Following the completion of works next year, the hotel within Atlas Capital will be the largest in Podgorica and will be managed by an international operator - said Alseddiqi. Abu Dhabi Capital Management is a company that invests in Gulf Cooperation Council (GCC) countries, Great Britain, and eastern Europe. 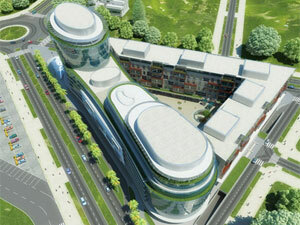 - Atlas Capital is a joint project of Capital Investment and Atlas grupa. Atlas Capital is the largest business and residential multipurpose complex in the Balkans and represents a blend of top-quality luxury suites, office space, hotel, retail stores, and an underground parking lot - it is said in a release. ADCM was established in Abu Dhabi. It invests in various sectors. The company has over 40 years of experience in key investment markets, including the Near East and northern Africa, North America, eastern Europe, Europe, and southeast Asia.